We know Technology. We deploy imagination, inspiration, and intuition to help our clients solve complex technical disputes. Trial lawyers with deep technical expertise, we litigate software, hardware, data, semiconductor, 3D printing, and high-tech manufacturing claims and cases. As technology attorneys, we have cultivated a host of in-house resources, including a team of Ph.D. scientists who know the demands of IP litigation. In addition, our AFAs, in-house Ediscovery, Legal Project Management, and OneBudget® offer clients cost controls that allow protection and defense of innovation on plan and within budget. When proprietary rights determine competitive advantage, we win big cases and achieve extraordinary results. Morton recently became the first attorney to have a PTAB trial in each of the four possible AIA patent challenges before the PTAB. 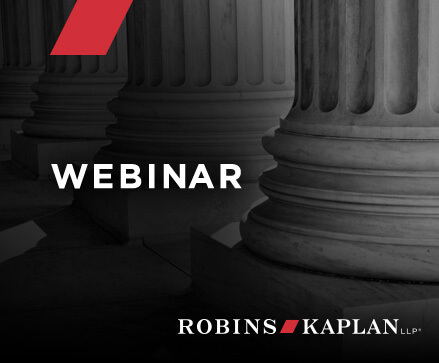 Join Bryan Vogel and Derrick Carman of Robins Kaplan for an informative webinar. A pair of recent decisions out of the U.S. International Trade Commission illustrate the potential importance of the consistency of early expert disclosures in an investigation. Efficient Drivetrains, Inc. v. Toyota Motor Corp.: Represented Efficient Drivetrains, Inc. in a dispute with Toyota Motor Corp. regarding a portfolio of fuel-efficient technology patents for hybrid and plug-in hybrid vehicles. The dispute was resolved on February 21, 2012 when a confidential agreement was reached, providing Toyota with freedom to operate. Union Oil Company of California (“UNOCAL”) v. Atlantic Richfield Company, et al. : Represented UNOCAL in a patent infringement case over UNOCAL’s patent on gasoline. Jury verdict and ultimate judgment with interest and attorney fees in favor of UNOCAL amounted to $91 million. Personal Audio LLC v. Apple Inc.: A patent infringement case in which a Texas federal jury awarded our client, Personal Audio LLC, $8 million in damages after finding that Apple’s iPods infringed our client’s patent for an audio player that can download or receive navigable playlists. The verdict was announced on July 8, 2011. The court also awarded prejudgment interest in the amount of $4,182,331 for a total judgment of $12,182,331. TiVo v. Verizon (E.D. Texas): Represented TiVo in a suit against Verizon alleging Verizon's FiOS service and products infringed three TiVo patents. Verizon counterclaimed with six patents related to various set-top box features. Verizon dismissed all but one of its counterclaim patents. The case settled before trial. Convolve, Inc. v. Dell, Inc., Hitachi Global Storage Tech., Inc., Hitachi Ltd., and Western Digital Corp.: A case in which a federal jury in Marshall, Texas, found that the defendants had willfully infringed the patent of the firm’s client, Convolve, Inc. The patent relates to hard-disk drive technology. The verdict was announced on July 26, 2011. LaserMaster v. Sentinel Business Systems: Represented LaserMaster, a manufacturer of large-format inkjet printers in a trade secret case brought under Minnesota law. Retained just five weeks before trial, we won a jury verdict of $2.2 million, one of the largest trade secret verdicts ever awarded in Minnesota, where the case was tried. Imation Corp. v. Koninklijke Philips Elec. N.V., et al., 586 F.3d 980 (Fed. Cir. 2009): Convinced the appellate court to reverse the entry of judgment on the pleadings dismissing two of Imation’s key counts and instead to order judgment for Imation on the question of whether certain entities formed or acquired later qualify as “subsidiaries” that could benefit from Imation’s patent license with Philips. In the Matter of Certain Flash Memory Controllers, ITC Inv. No. 337-TA-619: Represented Imation Corporation in a case of alleged patent infringement related to flash memory technology owned by SanDisk Corporation. The technology is used in several devices, most notably portable USB memory cards. Based on prior art, the International Trade Commission determined that patent 7,137,011 was invalid for obviousness and that Imation Corporation’s products do not infringe the asserted claims. Tulip Computers Int’l v. Dell Computers, Inc. (D. Dell. 2003): A patent infringement action tried to a jury in which our firm represented the patent owner, Tulip, a Dutch corporation. The case settled two days before going to the jury with Dell paying Tulip $49.5 million. Juniper Networks v. Shipley, Fed. Cir. No. 2010-1327: Defended inventor in a false patent marking case brought under 35 USC sec. 292 in the Northern District of California. Case dismissed under Rule 12(b)(6) for failure to state a claim; dismissal affirmed at the Federal Circuit on April 29, 2011. Ricoh Corp. v. Pitney Bowes Inc.: Defended Pitney Bowes in a patent infringement involving communications and control within Pitney Bowes’ mailing machines. The case was tried in the United States District Court for the District of New Jersey, Trenton Division, with Judge Brown presiding. The jury returned a verdict of invalidity in favor of Pitney Bowes finding anticipation of all 18 asserted claims. In addition, during trial, the Court entered summary judgment of anticipation of four additional claims. Jury decision was affirmed in a post-trial memorandum by the District Court and summarily affirmed by the Federal Circuit. Braintree Laboratories v. Novel Laboratories: Representing first-to-file generic pharmaceutical company relating to gastric lavage treatment Suprep (sodium sulfate, potassium sulfate, magnesium sulfate). Purdue Pharmaceutical Products L.P., et al. v. Novel Laboratories, Inc: Representing first-to-file generic pharmaceutical company seeking to market an equivalent to Intermezzo, a sub-lingual formulation of zolpidem used to treat middle-of-the-night sleeplessness. Fonar v. General Electric: Represented Fonar Corporation and Dr. Raymond V. Damadian in a patent infringement action against General Electric involving patents on magnetic resonance imaging (MRI) machines. At trial, the jury awarded Fonar $110.5 million. The Court of Appeals for the Federal Circuit affirmed almost the entire award, ordering General Electric to pay $103.4 million, reported at the time to be the largest patent infringement jury verdict ever upheld on appeal (IP Worldwide). Fonar Corporation v. General Electric Co., 107 F.3d 1543 (Fed. Cir. ), cert. denied, 118 S.Ct. 266 (1997). After the Supreme Court denied certiorari, General Electric paid Fonar $128 million (judgment plus interest). Medtronic Inc. v. Boston Scientific Corp. et al. : Represented Medtronic, Inc. in a dispute with Mirowski Family Venture’s assertion that Medtronic’s cardiac resynchronization devices infringed certain claims of U.S. Patent Nos. RE38,119 and RE39,897. After a bench trial, a Delaware district court held that Mirowski Family Ventures, as the patentee, bore the burden of proving infringement and failed to meet that burden, entering a judgment of non-infringement on behalf of Medtronic. On appeal, the Federal Circuit reversed the district court on the burden of proof issue and held that Medtronic, as the licensee, bore the burden of proving non-infringement. Medtronic filed a petition for certiorari to the U.S. Supreme Court. The Supreme Court granted the petition and reversed the Federal Circuit, holding that the patentee always bears the burden of proof, even where the licensor cannot counterclaim for infringement because of the existence of a license agreement. On remand from the Supreme Court, the Federal Circuit affirmed the district court’s finding of non-infringement for Medtronic, awarding Medtronic a complete victory in the case. Promega Corporation v. Applied Biosystems, LLC, Life Technologies Corporation, and California Institute of Technology: Judge Richard A. Posner ruled in favor of our client, Promega Corporation, in a suit that it initiated against one of its competitors. In an opinion dated June 12, 2013, from the U.S. District Court for the Northern District of Illinois, Judge Posner ruled that certain claims of U.S. Patent No. RE43,096, asserted against Promega, are invalid. Promega prevailed in its arguments that the claims of the ’096 patent were invalid due to the breadth of the claim constructions that the defendants sought and obtained. Certain asserted claims were invalid for lack of written description support. While the patent describes an improvement to DNA sequencing, the breadth of the claims encompassed technologies that Caltech did not invent, including the PCR-based methods on which Promega’s accused products are based. The asserted claims were additionally invalid as anticipated or obvious in view of the prior art, including a prior art patent to Caltech, which expired years ago. Judge Posner also found certain claims invalid for obviousness type double patenting. Defendants appealed various aspects of Judge Posner’s decision and the judgment. Six days after oral argument, the Federal Circuit summarily affirmed the judgment, awarding Promega a complete victory in the case. Prometheus Laboratories, Inc., et al. v. Quest Diagnostics, Inc.: Obtained dismissal of all claims in Prometheus Laboratories, Inc., et al. v. Quest Diagnostics, Inc., U.S. District Court, San Diego, California. Patent case involving DNA. Medicis Pharmaceutical Corporation v. Upsher-Smith Laboratories, et al. : Lead trial counsel defending Upsher-Smith Laboratories in a patent suit to enjoin the sale of a pharmaceutical formulation. Following a two-day bench trial on the issues of infringement, validity, and enforceability of the plaintiff’s patent, the Court denied a request to temporarily enjoin the client from making and selling its products. All claims asserted against our client were subsequently invalidated during an ex parte re-examination based on the same arguments and evidence we presented during the bench trial. The invalidity of the claims was summarily affirmed on appeal to the CAFC. The district court action is No. CV05-3458 (D. Az. filed October 27, 2005). The re-examination appeal is No. 2009-1291 (Reexamination No. 90/008,068). Black & Decker v. Robert Bosch Tool Corporation: Represented Black & Decker in multi-patent dispute regarding jobsite radio charger. Achieved favorable claim construction for the patents-in-suit and denial of defendant Bosch’s four summary judgment motions. Full jury trial on the merits conducted before the Honorable Amy J. St. Eve, Northern District of Illinois, resulted in a jury verdict finding both patents-in-suit valid and infringed, awarding $1.75 million in lost profit and reasonable royalty damages as well as determining that Bosch’s infringement was willful. Andersen v. Pella Corp. et al: Represented plaintiff Andersen Corporation in overturning a district court decision granting the defendants summary judgment and finding that claims of the asserted patent were invalid as obvious. The Federal Circuit’s decision was one of the first post-KSR District Court findings of obviousness to be reversed by the Federal Circuit. The Supreme Court denied the defendants' petition for certioriari. 2007-1536, 2008-WL4927431, (Fed. Cir. Nov. 19, 2008), cert. denied. Honeywell International et al. v. Apple et al. : Representing Honeywell in patent litigation against the Liquid Crystal Display consumer electronics industry, venued in Delaware. Case was filed in 2004, and to date, approximately 85% of the manufacturing industry has taken a license. St. Clair Intellectual Property Consultants, Inc. v. Canon, Inc. et al., No. 03-0241 (D. Del., filed February 28, 2003): Represented St. Clair Intellectual Property Consultants, Inc. in a patent infringement case in which a federal jury in Wilmington, Delaware, awarded $34.7 million after a finding that Canon infringed four patents relating to digital camera technology. The verdict was announced on October 8, 2004. Honeywell Inc. v. Victor Company of Japan and U.S. JVC Corp.: Trial counsel on behalf of Honeywell Inc. in action for patent infringement of color filters in video cameras. The case was tried in the U.S. District Court, District of Minnesota, St. Paul, Minnesota, Frank, Judge. Jury verdict in favor of Honeywell for $30 million, which reflects royalties of 2% of JVC’s sales of the accused camcorders to calculate past damages for the unlicensed use of the technology. St. Clair Intellectual Property Consultants, Inc. v. Fuji Photo Film, Ltd. et al., No. 03-241 (D. Del., February 28, 2003): Trial counsel a case in which a federal jury in Wilmington, Delaware, awarded our client, St. Clair, $3 million after a finding that Fuji infringed four patents relating to digital camera technology. The verdict was announced on October 25, 2004. St. Clair Intellectual Property Consultants, Inc. v. Sony Corp. et al., No. 01-557 (D. Del., Aug. 14, 2001): Trial counsel in a case in which a federal jury in Wilmington, Delaware, awarded St. Clair $25 million after a finding that Sony infringed four patents relating to digital camera technology. The verdict was announced on February 25, 2003. The parties entered into a license agreement two days later, the terms of which are confidential. Digital Sun v. The Toro Company: Obtained summary dismissal of complaint asserted against The Toro Company alleging violations of the federal antitrust laws (Sherman and Clayton Acts) as well as California unfair business practices and common law fraud. The complaint involved smart sprinkler technology and arose out of Toro”s consideration of a potential business relationship with the named plaintiff regarding that technology, including the licensing of certain intellectual property related to that technology. The issues presented in the motion to dismiss included the plausibility of the allegations under the standard set forth in the Supreme Court’s decision in Twombly, as well as the intersection between the antitrust and patent laws. The dismissal briefing focused on key points in the related documentation and dealings that confirmed the business reality existing between the parties, thereby overcoming an otherwise complex set of allegations presented in the complaint. The matter settled shortly after the summary dismissal. Ride and Show v. MTS: Represented MTS, a manufacturer of amusement park rides, against allegations of patent infringement brought by patent holder Ride and Show. The patent at issue covers control of the seat movements of a typical amusement park ride. The rides involved in the case were called “Men in Black” and “Cat in the Hat.”After discovery and a Markman hearing, the Court issued its claim construction, which directly tracked our arguments. Obtained a dismissal with prejudice from the action, with no money paid. Electromotive Division of General Motors Corporation v. Transportation Systems Division of General Electric Co., et al. : Defended General Electric in a patent infringement action brought by General Motors involving planetary and compressor bearings used in diesel locomotive engines. Summary judgment, which found invalidity of the patents on the basis of on-sale bar was upheld by the Federal Circuit in Electromotive Div. of General Motors Corp. v. Transportation Systems Div. of General Elec. Co., 417 F.3d 1203, 75 U.S.P.Q.2d 1650 (Fed. Cir. 2005). RealSource, Inc. v. Best Buy Co., et al. : Trial and appellate counsel for Best Buy in litigation involving patent claims asserted in U. S. District Court in Austin, Texas. The plaintiff alleged Best Buy’s gift cards infringed its patent, and it sought more than $32 million in damages. Summary judgment was granted. The judgment was affirmed by the Federal Circuit on June 23, 2008. Sharper Image v. Honeywell: Represented Honeywell in patent infringement suit brought by Sharper Image against Honeywell. The case was venued in the Northern District of California. It involved air cleaning technology, and Honeywell asserted a false advertising counterclaim. Advanced Micro Devices v. Samsung: Brought to resolution patent litigation for Advanced Micro Devices (AMD) against Samsung in the Northern District of California. The case involved allegations that Samsung’s DRAM, SRAM, and NAND memory products; its system logic products; and its consumer products infringed seven AMD patents covering technologies in memory architecture, processor micro-architecture, MOS-transistor fabrication and design, and user interface design for consumer products. Samsung asserted six patents against AMD’s x86 processors and graphics processing units (GPUs) covering technologies in processor micro-architecture design, and semiconductor fabrication and process control. After three years of litigation and two mediations, the parties resolved the matter at the close of expert discovery and dispositive motion briefing shortly before trial. Reputed to be the 4th largest patent case settlement and/or verdict from January 2010 through June 2011. Silicon Graphics, Inc. v. Advanced Micro Devices: Represented Advanced Micro Devices (AMD) in patent litigation against Silicon Graphics, Inc. (SGI) in the Western District of Wisconsin. The case involved three patents in the areas of graphics processing. The District Court granted summary judgment of non-infringement on all three patents. The summary judgment was also based on a license SGI granted to Microsoft. The case was appealed to the Federal Circuit. AMD sustained two-thirds of the non-infringement issues appealed. The case was remanded to the District Court for resolution of remaining issues as to five claims on one patent. The case resolved shortly before trial after 37 motions-in-limine were filed by AMD. Grantley v. Clear Channel Communications, Inc.: A patent infringement case in which a federal jury in the Eastern District of Texas awarded Grantley Corporation $66 million. The jury found that Clear Channel Communications, Inc. infringed on four of Grantley Corporation’s patents related to an integrated inventory management system for radio advertising time. The jury also found that the infringement was willful. The verdict was announced on April 22, 2008. On June 11, 2008, the court enhanced the damages by more than $16.5 million, awarded prejudgment interest, and entered judgment totaling more than $89 million. The case settled while on appeal under confidential terms. In re Certain GPS Navigation Products, Components Thereof, and Related Software: Represented Honeywell Inc. in the enforcement of a series of patents related to GPS and navigational systems for use in the recreational marine industry. Filed suit in 2009 in district court. While the patents were waiting re-examination, initiated proceedings before the International Trade Commission against one named defendant, Furuno Electric Co., related to additional acts of infringement of additional patents. Negotiated a successful resolution of that matter, along with resolution of that portion of the original district court action related to that defendant. In the Matter of Certain Video Analytics Software, Systems, Components Thereof: Trial counsel for a video analytics software company, ObjectVideo, Inc., in the International Trade Commission and district court case concerning computer vision technology. ObjectVideo is enforcing six patents against video analytics software used in video surveillance equipment, such as video security cameras and video encoders. The ITC and district court complaints were filed in 2011. The evidentiary hearing at the ITC was held in July 2012, and the matter was resolved just prior to the Initial Determination. Eolas Technologies, Inc. and The Regents of the University of California v. Microsoft Corporation: Represented Eolas Technologies, Inc. and The Regents of the University of California, in action for patent infringement of web browser technology for the delivery of interactive applications embedded in web pages. The case was tried in United States District Court, Northern District of Illinois, Eastern Division, Chicago, Illinois, Zagel, Judge. Jury verdict in favor of Eolas and the University of California, on issues of infringement, validity, and damages in the amount of $520.6 million. On January 14, 2004, the court entered judgment for $565,894,868, which includes the amount of the original verdict plus prejudgment interest. On appeal, the Federal Circuit affirmed the finding of infringement and the damages award, and it ordered that Microsoft’s invalidity and inequitable conduct defenses be retried. The case settled on a confidential basis four days before the start of the invalidity trial. WNS Holdings LLC et al. v. Northwest Airlines Inc.: Defended Northwest Airlines, Inc. in a patent infringement suit relating to GPS and avionics technology. Specifically, plaintiffs accused Northwest of infringing the patents through the alleged use of Automatic Dependent Surveillance, including ADS-B. After extensive discovery, a dismissal of the action was obtained, and the client secured the right to potentially recover its fees and costs in the event of any future litigation. Racal NCS, Inc. v. Alliant Techsystems Inc., The Raytheon Group, Hughes Aircraft Company: Represented defendant in international arbitration before International Centre for Dispute Resolution tribunal in a contract and fraud dispute relating to the sale and performance of an underwater sonar device used for mapping ocean floors for the installation of optic fiber communication cables. Managing Intellectual Property recognized both the firm and its attorneys for excellence in intellectual property litigation. How many bites at the apple does the Patent Trial and Appeal Board allow?